The Pod concept was introduced by Kubernetes. Podman pods are similar to the Kubernetes definition. Every Podman pod includes an “infra” container. This container does nothing, but go to sleep. 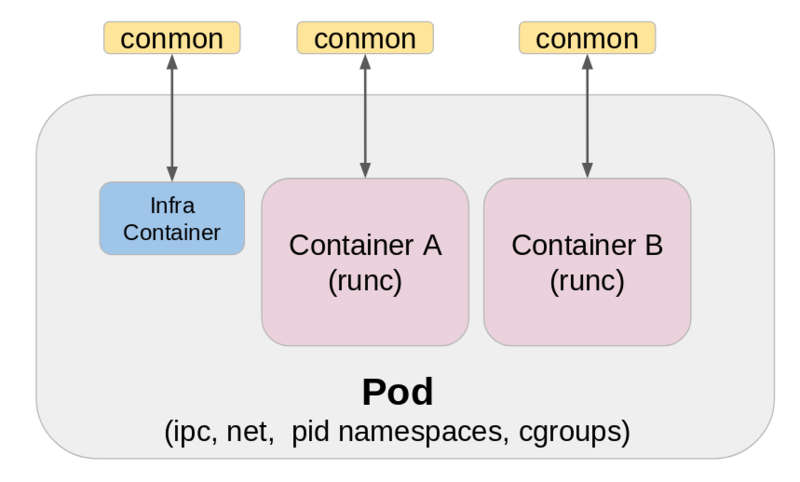 Its purpose is to hold the namespaces associated with the pod and allow podman to connect other containers to the pod. This allows you to start and stop containers within the POD and the pod will stay running, where as if the primary container controlled the pod, this would not be possible. The default infra container is based on the k8s.gcr.io/pause image, Unless you explicitly say otherwise, all pods will have container based on the default image. Most of the attributes that make up the Pod are actually assigned to the “infra” container. Port bindings, cgroup-parent values, and kernel namespaces are all assigned to the “infra” container. This is critical to understand, because once the pod is created these attributes are assigned to the “infra” container and cannot be changed. For example, if you create a pod and then later decide you want to add a container that binds new ports, Podman will not be able to do this. You would need to recreate the pod with the additional port bindings before adding the new container. In the above diagram, notice the box above each container, conmon, this is the container monitor. It is a small C Program that’s job is to watch the primary process of the container, and if the container dies, save the exit code. It also holds open the tty of the container, so that it can be attached to later. This is what allows podman to run in detached mode (backgrounded), so podman can exit but conmon continues to run. Each container has its own instance of conmon. We expose most of the interaction with pods through the podman pod commands. Among other actions, you can use podman pod to create, delete, query, and inspect pods. You can see all the pod related commands by running podman pod without any arguments. podman pod - Manage container pods. Pods are a group of one or more containers sharing the same network, pid and ipc namespaces. The traditional way to create a pod with Podman is using the podman pod create command. Creates a new empty pod. The pod ID is then printed to stdout. You can then start it at any time with the podman pod start <pod_id> command. The pod will be created with the initial state 'created'. In its most basic context, you can simply issue podman pod create and Podman will create a pod without extra attributes. A random name will also be assigned to the pod. Note that the container has a single container in it. The container is the “infra” command. We can further observe this using the podman ps command by passing the command line switch *–pod*. Here we can see that the pod ID from podman ps matches the pod id in podman pod list. And the container image is the same as the default “infra” container image. You can add a container to a pod using the *–pod* option in the podman create and podman run commands. For example, here we add a container running **top** to the newly created *youthful_jones* pod. Notice the use of *–pod*. And now two containers exist in our pod. Looking at the list of containers, we also see each container and their respective pod assignment. We recently added the ability to create pods via the podman run and podman create commands. One upside to creating a pod with this approach is that the normal port bindings declared for the container will be assigned automatically to the “infra” container. However, if you need to specify more granular options for pod creation like kernel namespaces or different “infra” container image usage, you still need to create the pod manually as was first described. Nevertheless, for relatively basic pod creations, the shortcut is handy. As this feature was recent added, it isn’t available in the version of Podman included with Red Hat Enterprise Linux 7.6 and 8 Beta. To create a new pod with your new container, you simply pass *–pod*: new:<name>. The use of **new:** indicates to Podman that you want to create a new pod rather than attempt to assign the container to an existing pod. The following asciinema demo shows how to create a pod via the shortcut method. The container being run is a MariaDB container image and I bind only to its 127.0.0.1 address. This means only containers in the same pod will able to access it. 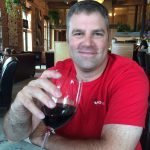 I then run an alpine container, install the MariaDB-client package, connect to the database itself, and show defined databases. In Podman, the status of the pod and its containers can be exclusive to each other meaning that containers within pods can be restarted, stopped, and started without impacting the status of the pod. Suppose we have a pod called demodb and it contains two containers (and an “infra” container) running a MariaDB and a nginx session. If we wanted to stop and start the nginx container, the status of the MariaDB container and the pod itself will remain unchanged. With the nginx container stopped, we can still observe the demopod is running and the MariaDB container remains unchanged. And we can start the nginx container to restore the pod back to its original state. We can also stop the pod and all of its containers using the podman pod stop command. And if we look at the status of the pod, it will show a state of “Exited”. Likewise, we can also start the pod and all of its containers back up. After which, all the containers in the pod should be running and the pod should show a status of “Running”. There is also a podman pod restart command that will restart all the containers within a Pod. The ability for Podman to handle pod deployment is a clear differentiator to other container runtimes. As a libpod maintainer, I am still realizing the advantages of having pods even in a localized runtime. There will most certainly be more development in Podman around pods as we learn how users exploit the use of them. For more information on Podman, make sure you visit the libpod project page on github. Relevant blogs and news related to Podman can also be found at podman.io. Podman is included with Red Hat Enterprise Linux 7.6 as well as Red Hat Enterprise Linux 8 beta.